This week at ExamOne, we’re celebrating Customer Service Week to recognize the ExamOne Customer Service Group (CSG) and their commitment. The ExamOne CSG is made up of 52 team members in Lenexa, Kan., and 78 team members in San Diego, Calif., and each of them are committed to providing the highest levels of customer service to our clients and our clients’ applicants. In addition to our helpful CSG team members, ExamOne clients have access to quick and easy customer service online. They can check case status or place paramedical exam orders at ExamOne.com. 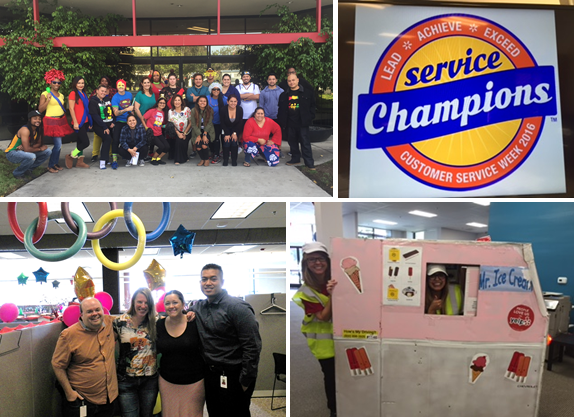 To celebrate Customer Service Week at ExamOne, employees from all departments are joining CSG in Olympic-style events throughout the week where teams earn points for completing challenges and showing team spirit. Here are a few fun pictures of your favorite CSG teams!